By now most people are familiar with the Melissa Harris-Perry video where she accused us of having an old fashioned notion of our children belonging to us, when in fact they belong to the collective. I believe MS. Harris-Perry has it wrong. We have been treating our children as belonging to the collective for a long time and that is one of the biggest problems with education. We collectively pay for education. Ever since it was mandated in our country (and our state) we signed the social contract that says we will all pay for education because ultimately we will all benefit from preparing future generations. While this payment was handled at the local level there were fewer problems. If the locals didn’t like the school teacher they chose, they replaced her. She was accountable to them because they paid her salary directly. That means that they will set standards (in the broadest sense) for how we operate our schools. The nature of a bureaucracy to justify and expand its existence guarantees that they will seek greater and greater control over what we do locally. This sets up an imbalance. The average school district only receives 7% of its funding from the Federal government, yet focuses more than 50% of its time on accountability measures to the feds: reporting, training, programs etc. We should probably congratulate congress because that is one heck of a return on an investment. The problem arises in terms of achieving consensus with an ever expanding group of stakeholders. Put seven teachers together in a classroom and have them agree on the best way to teach math. You will be there for days. Ask ten different school districts to agree on the definition of “critical thinking” and how to teach it and you may never get consensus. 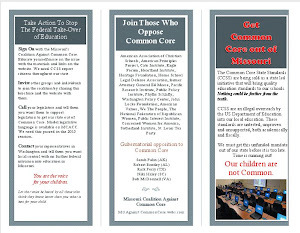 Common Core shines a spotlight on the extreme difficulty of developing agreement about education; what should be taught and how. Finding the balance between accountability and flexibility is a Sisyphean task . Last week, as the House Education committee began debating the ESEA, they were only able to pay lip service to local control. After all, they must be responsible stewards of your money and therefore have to maintain some sense of accountability. The public will never be fully satisfied with their work because it will still require them to set some standards and accountability at the national level that we will never all agree on. As long as we continue to send our money for education through them, we will answer to them. 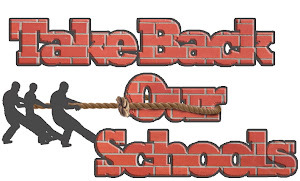 An audience member at a recent Common Core meeting said he would never vote for another bond issue or tax increase from his district so long as they were implementing Common Core and other federally pushed programs. The room erupted in applause. Top down intervention is going to make life at the local level very challenging. Wouldn’t it be far simpler to find 7% savings and just do what we can agree on locally? Wouldn’t that make the local taxpayer infinitely happier?